Voluntary work threatened by benefit sanctions. Did you know? Contractors funded to run the Government’s compulsory community work seem to be passing the buck to volunteer organisations. When unemployed people complete two years on the Work Programme without getting back to employment, they are put on to the Government’s Help to Work programme that includes mandatory community work: they will have their benefits stopped if they don’t do the work. Various contractors are being funded to provide the training and arrange the community work. But it seems that some are trying to use the voluntary sector to run those work placements – without passing on any of the funding. This raises a key principle: voluntary work is exactly what it says on the tin. Being required to work at the risk of social security benefits is quite different. Is it ethical for voluntary organisations to be required to report “volunteers” who don’t show up? Equally important is the quality and effectiveness of community work. By definition, all of these people will have been out of work for at least 2 years and often much longer. They have not been able to get jobs despite the support of Work Programme professionals so community work is likely to require even more effort and supervision to prepare them to succeed on the job market. Such support takes time, skill and experience so it’s not without cost. And this doesn’t even take in to account that a sizeable proportion of the community workers are likely to have additional needs due to health conditions/disabilities. It seems inescapable that either those contracted to manage the community work need to provide this support or they need to pass on the right proportion of their funding to whoever takes on the community workers. Already, in some areas, voluntary sector organisations are rejecting involvement in community work because of the ethics and because they don’t have the resources to fulfil the contractors’ responsibilities. Perhaps this policy is at risk of foundering because the detail of delivery hasn’t yet been fully worked out? I have just celebrated 30 years in the same house. Built in about 1880, it still has lots of original Victorian features but has also evolved over the years: new rooms, garden landscaping and interior decorating. 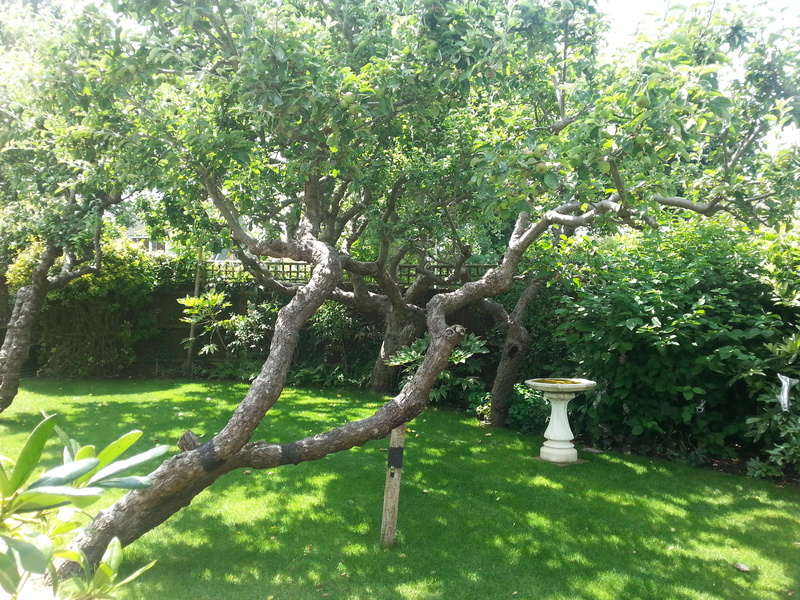 Here’s a picture of one of the apple trees that has survived from the orchard on which the house was built – It must have been planted in the mid 1800s and still produces wonderful Cox’s Pippins for tarte Tatin.